Even though these photos were taken in February, I thought it befitting to post them today, as the first of March greeted us with yet another snow storm. My weekend in Boston was fun, though only a further confirmation of the fact that I am not a creature built to withstand the cold, even indoors I did not wish to be far from my coat. My new Cole Haan booties, the ones which took me four months to find, were put to the test this weekend, and I'm pleased to say that after a day (approximately 18 hours of wear and walking) my feet were not in any severe pain or discomfort. This is kind of amazing for me. I purchased them for $95, which is about half off their list price of $198, though last I looked they were down to $83, which is frustrating, but what can I do? (From what I understand the price adjustment window with Amazon is seven days after shipping.) I'll I can say is that I'm happy I had them to wear over the weekend, and for the comfort and what I assume to be high quality of the boots, I'm confident I will get my cost per wear way down. March is a new month, and a new chance to stick to my budget, right? You look warm and chic! Love the booties and great price. I'm hoping we get some Spring weather soon! If you take no solace in anything else in the terrible weather you're dealing with, know that your readers are deeply impressed with your extensive coat collection - I don't know how you manage to make coats look different and interesting day after day, but you've done it. And of course, for the millionth time, I have to comment on how much I absolutely adore your bag. I'm still scouring the internet in the hopes of stumbling upon the same one so I can make it mine! This is my favorite outfit of yours,ever. Although I think I have like 20 of your outfits pinned. Gosh, that is just so gorgeous! Contact Amazon customer service and see if they could make an exception to the policy and give you an adjust me. In my experience (I work in retail), if you are nice and ask for it as a gesture of good customer service, they will offer if it they can. The worst thing is that they will say No to you, so nothing to lose! 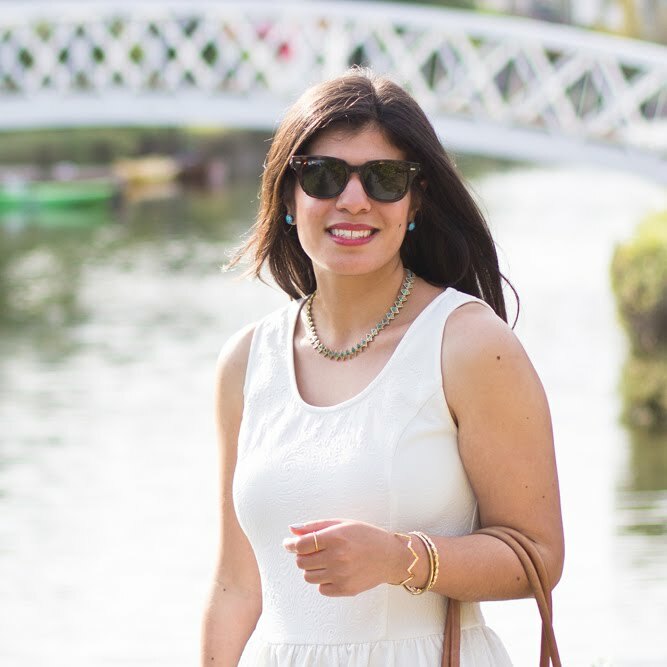 Love the blog and always enjoy your style! Lovely outfit and your hat is perfect! 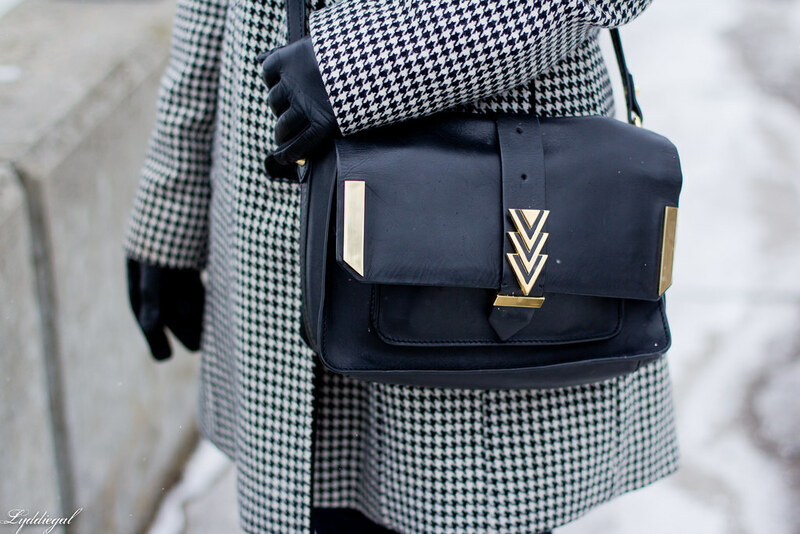 Omgsh that houndstooth coat is fantastic!! I loooooovve Cole Haan so your boots are perfect! Great to know that they are not only a great looking pair of boots but that they are also comfortable! I love your blanket scarf and beanie! And I'm also one to watch religiously for a pair of shoes to come back in stock or go on sale... Glad you found yours! That coat is seriously adorable and paired with a plaid scarf-perfection! I get frustrated when I see prices drop after the adjustment period, too, but I try to remember that for the most part I try to be a very savvy shopper and typically get the lowest price. Ya can't win them all (unfortunately)! You look lovely and definitely warm! As for Amazon, you could always drop an email or chat and see if they make an exception! These are gorgeous pictures of you! I love your coat!! That is a success--those boots look great and I'm glad they're so comfy. Sorry to hear that you got MORE snow. I hope spring comes soon! Ohhh look at all of that snow! It is so pretty, but I bet you are over it. Hopefully spring is just around the corner!! Stay warm! I really love that scarf with this coat! And the snowflakes look so pretty! But it also looks freezing! Loving the scarf and the coat! I think at $96 those boots are still a pretty good investment. I am glad these boots worked out for you - walking on them for this long period of time really is a good test on the comfort. I love these photos - so beautiful. This look is so chic! I never look this cute when I'm all bundled up! LOVE IT when a pair of boots/shoes passes the all-day (or all-night) test! These CH's are awesome. Man, I hear you- totally sick of snow. It's March now, so spring has GOT to be around the corner, right? You look like you are staying warm in that adorable coat and hat! great casual winter look! Very chic and you look very happy - it a joy for my eyes! thank you! This is such a great winter chic look! I'm glad the Cole Haans worked out. I get less upset when something is marked down after I've worn it because that means I really wanted it and I can probably make the cost per wear work out. At least that is how I rationalize it to myself! Really cute and chic outfit, especially for sightseeing and walking all day! Cheers to you for finding a great pair of boots. Visiting from the Trend Spin linkup.